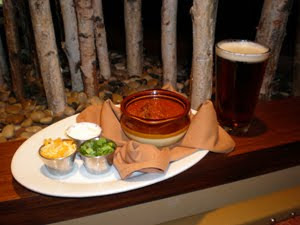 With temperatures dropping, it's time to head indoors to Birch River Grill to sample chef John Ayaleanos' award-winning Wild Game Chili, made with grilled tender bison ranch sirloin, Broadleaf Farms wild board, sausage, smokey tomato sauce and heirloom beans ($6 cup/$9 bowl). Celebrate the beginning of fall and go easy on the wallet with Birch River Grill’s $20 prix fixe menu, offered daily after 11 a.m. in addition to the restaurant's regular menu in October. Begin with an appetizer, choosing from the BRG Salad, baby greens, shredded Michigan carrots, beefsteak tomato wedges and seedless cucumber slices; the Granny Apple Onion Soup, paprika Parmesan croutons, Wisconsin Swiss and provolone cheese; or the Soup of the Day. Entrée selections include a choice of either: Nueske Bacon Wrapped Pork Loin Chop, kiln dried sour cherry sauce, smashed Yukon gold potatoes and steamed green beans; Seared Herb Rubbed Tilapia, wild and saffron rice pilaf, butter glazed broccolini and lemon vinaigrette; or Basil Pesto Cream Linguine, sundried tomatoes, baby spinach and shaved Grana Padano Parmesan. Finish off with Berry Sorbet, served with fresh berries, for dessert. The whole month of October, on Mondays – Fridays, Bud Light drafts are only $1.99 all day and appetizers are only $1.99, from 4:30 p.m. – 6 p.m. The appetizers include Buffalo Hot Wings, carrots, celery sticks and Wisconsin blue cheese dipping sauce; Mozzarella Cheese Sticks served with a chunky marinara; Cheese Quesadillas, Wisconsin Monterey and cheddar cheese, cilantro cream and pico de gallo; Beer Battered Onion Rings served with a ranch dipping sauce; Popcorn Shrimp with a spicy Asian dipping sauce; Potato Skins, four skins filled with melted Wisconsin cheddar, crisp pepper bacon, sour cream and green onions; and Boursin Stuffed Mushrooms along with a horseradish sipping sauce. Birch River Grill celebrates Sweetest Day on Saturday, Oct. 17, with a sweet table. The sweet table will be a Chef’s selection of desserts with coffee and tea offered with the purchase of an entrée on this day. Birch River Grill finishes off October right with spooky drink specials offered only on Halloween, Saturday, Oct. 31. Specials include a Vampire’s Kiss, Grey Goose Vodka, Sapphire Gin, Patron Tequila, dry vermouth, tomato juice and a pinch of salt ($9); the Gremlin, Crown Royal and lime juice ($6); Devil’s Advocate, Bacardi Limon, Triple Sec, sour mix, cranberry juice and a splash of grenadine ($6); and Wicked Witch Cider, Captain Morgan and hot apple cider ($6). Birch River Grill serves rustic American gourmet comfort food at 75 W. Algonquin Rd. in Arlington Heights. For reservations or more information, please contact Birch River Grill at (847) 427-4242 or visit www.birchrivergrill.com.